The terms “climate change” and “habitat destruction” have become almost passé when describing the impacts of humans on the environment. Yet, despite their universal use, it has been difficult to define the direct effect of such environmental impacts on many species of wild animals, or to predict which species may be especially vulnerable to human disturbance. Why is the red wolf (Canis rufus) listed as critically endangered while the coyote (Canis latrans) seems to thrive in any environment? Recently, we have combined animal-borne instrumentation with physiological measurements on wild carnivores to investigate how the biological profile of large mammals can predict the relative vulnerability or resiliency of a species to environmental changes. Video cameras carried by wild animals including Weddell seals diving in the Antarctic and African lions provide a diary of the movements and daily hunting patterns of these predators. When combined with the energetic cost of taking a step or a stroke in the pursuit of prey, we are able to evaluate the biological demands of finding food. In this presentation I’ll discuss how these hunting costs are altered by environmental disturbances and are able to quickly send a large predator into the death spiral towards extinction. I’ll also discuss several new, exciting projects happening on UCSC campus that will make us a leader in the preservation of large mammals on land and in the seas. Williams, T.M., Fuiman, L.A., Horning, M., and Davis, R.W. (2004) The cost of foraging by a marine predator, the Weddell seal Leptonychotes weddellii: pricing by the stroke. Journal of Experimental Biology 207: 973-982. Williams, T.M., Estes, J.A., Doak, D.F., and Springer, A.M. (2004) Killer appetites: Assessing the role of predators in ecological communities. Ecology 85(12): 3373-3384. Terrie M. Williams, Ph.D. is a Professor of Biology at the University of California in Santa Cruz, and has been studying large mammals for over 30 years. She obtained her PhD in Environmental and Exercise Physiology from Rutgers University (1981) and completed her post-doctoral studies at Scripps Institution of Oceanography and the Research Department of the San Diego Zoological Society. She was Director of the Valdez Sea Otter Rescue Center following the 1989 Exxon Valdez oil spill, and co-founder of the Center for Ocean Health at Long Marine Lab (UCSC, Santa Cruz, CA) where she held the first Endowed Chair in Ocean Health. 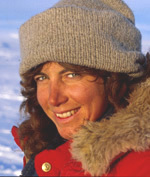 Her research expeditions have taken her around the world to study the survival strategies of Weddell seals in Antarctica, Steller sea lions, sea otters, and killer whales in Alaska, as well as cheetahs, lions and elephants in Africa. Her primary question is how do large (> 21 kg) animals survive in a rapidly changing world? Recognizing that the key to survival for both humans and animals is food and water, she and her colleagues have used miniaturized instruments carried by wild animals to record the hunting and drinking strategies of both marine and terrestrial species. With her team, she is working with aquariums, zoological parks, research scientists and wild animals across the globe to ensure healthy environments for both people and wildlife. Her latest project, the Center for Adaptive Physiology and Genetics (APGEN) is in development at UCSC. The goal is to create a national center to explore nature’s solutions for surviving in a changing world.